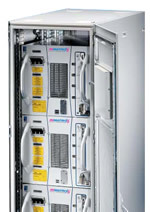 Rittal offers the RimaxtiX5 solution to address the growing Data Center IT infrastructure needs. With the RimatriX5 complete integral, scalable and efficient system solution, your servers will deliver the performance your company needs while minimizing your power consumption costs. Rittal RimatriX5 places emphasis on maximum packing density and efficient space utilization. Flexible configuration of the IT racks is a positive influence with regard to TCO and helps to lower the day-to-day rack operating costs. 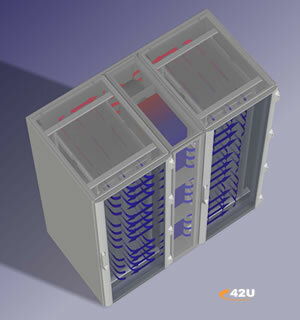 The heart of the rack-optimized design is the widely proven TS server enclosure platform. Ultramodern and flexible production processes secure excellent performance and value. Frame Profile: The symmetrical design ensures an absolute maximum of useful rack volume and permits scalable suite options for optimized space utilization in all planes. Interior configuration: Unique and extremely stable – thanks to the symmetrical two-level principle of the TS 8 profile. Depth-variable 482.6 mm (19˝) mounting angles permit even the individual configuration of heterogeneous server architectures. Surface protection: For optimum surface treatment and enhanced corrosion protection, Rittal uses the electrophoretic dip coat priming process originally developed for the automobile industry. Passive ventilation: The perforated front and rear doors can offer a 78 % ventilated surface in their punched plate sections for an optimum air flow to the installed hardware components. Access security: Ultimate access security is provided by a 4-point locking mechanism, which can furthermore be upgraded to integrate electronic access authorization. Operational reliability: A broad range of different modules permits a free choice of flexible floor fastening, cable entry and raised floor assembly options. In this way, individual system requirements can be realized quickly and simply. Cable management: From cable management to fiber-optic channels with protected bend radii or surplus cable holders in the rack. 482.6 mm (19˝) component shelves: Whether depth-variable, fixed installation or heavy-duty shelves for loads up to 150 kg – the comprehensive product range fulfils practically every wish when it comes to hardware integration. The slotted shelves also ensure an optimum vertical air flow. Drawers: Integrated multifunctional drawers provide for tidy accommodation of keyboards, documents or cables – also lockable, if required. Server integration: Depth-variable slide rails and heavy-duty rails for load capacities up to 150 kg. Flexible universal rails for the installation of heterogeneous server architectures using manufacturer-specific mounting kits. The power management product range for power distribution in the data centre is based on the consistent implementation of plug-&-play expansion – with no need to interrupt current operations. Downtimes are avoided and future operating costs are lowered. 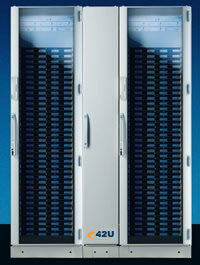 Rimatrix Modular UPS: Delivers 12 kW of efficient, reliable power in only 6U or standard rack space. Expand capacity by combining 12 kW modules in a building block fashion to deliver 60 kW or redundant backup power. Single-Phase (UPS): Small Capacity Tower, Line Interactive, and Double Conversion models available. Metered PDU: Provide reliable power distribution for all the devices in your equipment cabinet, from 5,000 to 20,000 Watts. Smart PDU: Provide reliable power distribution combined with remote power and environmental monitoring. 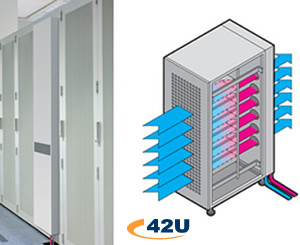 Basic PDU: Provide reliable power distribution for equipment racks and other data center applications. Rittal RimatriX5 offers solutions with passive cooling (utilizing the ambient air), active, rack-specific cooling, and high-performance cooling for temperature-neutral data centre expansion. Developed to remove high levels of heat from server enclosures, the high density cooling solution from Rittal utilizes our new LCP air/water heat exchanger providing uniform, effective and affordable cooling for servers and IT equipment. The special horizontal airflow of the LCP represents an adaptation of this widespread cooling principle, providing cooled air uniformly throughout the complete height of the enclosure. Using the same footprint and basic design as the Standard, the LCP Plus includes six fan modules that work in concert with the included heat exchanger to increase the useful cooling capacity to 95,540 BTU (28 kW). The LCP Plus is designed for cabinets 80″ (2000 mm) high by 48″ (1200 mm) deep and has a maximum air volume of 2825 cfm (4800 m3/hr). The LCP Plus (and LCP Standard) can be bayed to a single cabinet or between two enclosures. It is also possible to put a pair of LCPs on either side of especially hot cabinets for applications where extreme heat loads are present. The Liquid Cooling Package (LCP) is a closed-loop liquid cooling system that is ideal for compact, high-cooling output to servers. Bayed to the side of server cabinets, Rittal’s LCP is an air/water heat exchanger that provides evenly distributed cold air across servers. Each Liquid Cooling Package can contain up to three modules, providing cooling for one enclosure or two-bayed enclosures. Additional features of the LCP are: active condensate controls, full accessibility from front and rear and a horizontal riser for blade servers where extreme heat dissipation is needed. Easily retrofit to standard Rittal server cabinets, the LCP can be integrated with a CMC-TC controller to monitor temperature and control cooling levels.Air-cooled systems are fast reaching their reliability limit due to: increased difficulty dissipating dramatically elevating heat loads; high noise level due to air handlers and fans; electromagnetic compatibility problems caused by high-frequency CPUs; and reduced service life of active components. Liquid cooling can: stabilize temperatures; provide greater electromagnetic compatibility; allow increased server density; and increase Mean Time Between Failure. Rittal LCP systems and chillers use only spill-proof fittings and include built-in overflow trays for added peace of mind. The liquid and air routes are closed loop systems that do not add any additional heat into your data center environment. The LCP components are also hot swappable so you don’t have to take your critical data room servers down to service a unit. Ideal for retrofitting, the LCP Extend is installed on the rear door of problem racks. The LCP Extend can be ordered for use on cabinets from other manufacturers. Already using Rittal cabinets? The unit comes mounted into the proper replacement rear door – just swap it out. Rittal Rimatrix5 Climate control: Monitoring of the inside rack temperature and corresponding adjustment of the climate control systems to ensure reliable dissipation of the arising heat loads make a valuable contribution to minimizing operating costs. Rittal Rimatrix5 Rack extinguisher systems: With its active air intake feature, the Detection Active extinguisher system offers optimum smoke detection facilities for modern server enclosures. It draws in air samples via a duct system and analyses the contents of this air. Alarms are issued and the extinguisher triggered in two stages. A 3 U high central unit is able to serve several racks in a bayed suite. Integration into data networks (TCP/IP, SNMP, HTTP) is possible via CMC-TC (Computer Multi Control-Top Concept). As a key component of RimatriX5, CMC-TC is a complete security management system for protection against consequential damage and costs, as well as the central organizational interface to facility management. Fault and alarm messages are sent to defined service or security management systems, whether central or distributed, enabling the cause of a fault to be eliminated as quickly as possible. Data exchange via bus systems and integration into LAN and building management configurations provide for the transparency of all security-relevant data. 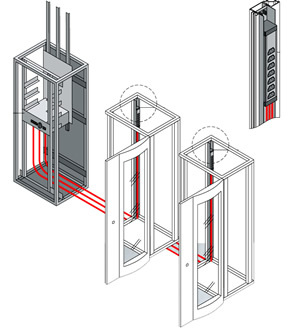 Rittal Rimatrix5 Access control: Doors can be controlled individually using numerical codes, magnetic cards, transponder technologies, smart cards or the latest biometric systems. Video: The compact cameras possess an integrated Ethernet port and can be distributed freely across the network, independent of the central control room. Zoom, night-sight and outdoor functions can be selected as required. The camera images can be managed via the Internet or through centrally installed software. Security modules offer reliable protection against external influences. KVM switches and monitor/keyboard drawers: Innovative keyboard, video and mouse systems offer a higher level of security, operating comfort and innovation. The auto-configuration function ensures optimum setting of the system. Up to 32 servers can be connected to each switch and provide simultaneous access for up to 8 users. Cascading even permits expansion to incorporate up to 512 servers and users are connected directly via a 1 U monitor/keyboard drawer, via a remote console at distances up to 300 m or else via a TCP/IP network. Rittal Rimatrix5 System administration: Offers via on-screen display (OSD) and two physically separate networks (Syslog, LDAP, Active Directory). Such central administration serves to raise transparency and cuts operating costs. Miniaturization and the ever greater performance of the hardware components place new demands on modern power management concepts. The answer to this dilemma: Power management with RimatriX5. The demands with regard to redundancy, scalability and maximum availability are bundled into a single system. Together, the solutions help to reduce operating costs and boost the availability of the overall system. It is even possible to retrofit new modules without interrupting operation. Particularly effective: The “n+1” technology, which ensures optimum redundancy and enhances availability. Indeed, the Power Modular Concept (PMC), with its innovative distributed parallel architecture (DPA), stands for ultimate system availability. PMC provides innovative protection against power supply problems. Through the combination of modularity (scalability and redundancy) and distributed parallel architecture (DPA), it guarantees maximum availability for critical applications. Thanks to the modular DPA system architecture, it is possible to expand capacities and stored energy times without interrupting operation. Intelligent battery management monitors battery readiness and guarantees system availability; furthermore protection against overcharging and exhaustive discharge. PMC is a new three-phase UPS concept offering modular “n+1” redundancy on the basis of double-conversion technology. The modular configuration permits capacity expansion through the integration of additional hot-swappable UPS modules. PMC modules for the power classes 10, 20, 30 and 40 kVA are prepared for 482.6 mm (19˝) installation in TS 8 server racks. The “n+1” system architecture means that there are always at least two modules able to share the critical load. If any module should fail, the other modules automatically take over the whole connected load without interruption. 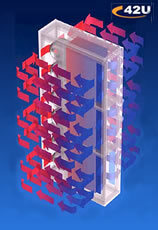 Modules can be retrofitted on a hot-swapping basis, without needing to switch the system to a bypass. Stored energy times can be tailored to the individual application. The distributed parallel architecture comprises integrated control electronics for rectifier, booster, inverter and static bypass. The CPU, furthermore, possesses parallel intelligence for enhanced reliability.